When kids have friends over to play in a household with pets, there is an element of the unknown about how pets will react to visiting children and vice versa. Friends may not have the same level of awareness about animals that you and your kids do, so here are some ways to keep playtime happy and safe for all concerned. Visiting children may have little or no experience with animals or they may come from homes where their pets are not treated the same way yours are. It’s important to have conversations with visiting children to determine what kind of mindset towards animals and experience with pets they have before they play with your pets, both for the well being of your own animals and for the safety of the friends who visit. Children who are not informed of a pet’s needs may accidentally (or sometimes purposefully) harm your pets or cause animals to lash out. After all, if a visiting friend gets bitten or hurt, chances are that either you or your pet will be held responsible, rather than the friend of your child. So taking steps to make sure everyone plays well together is for your benefit as well as the friends of your kids. If it’s the first time a visitor has come to your house and they haven’t had interactions with animals yet, then parents will need to lay a little groundwork before introducing a new friend to the household pet. You’ll need to show the visitor the right way to handle and touch your pet, give some pointers on what various body language signals mean and talk about respecting an animal’s need to end playtime on their terms, not when kids want them to. Try and get the visitor to see things from the pet perspective, have them imagine what they feel like when they are forced to do something against their will and talk to them about what kind of consequences can happen when an animal is afraid or feels trapped. Explain why touching animals while they are eating or sleeping isn’t a good idea as well. Every child should have a list of ground rules they follow that shows how to play safely and kindly with their pets. It’s helpful if this list is posted somewhere like a child’s room to act as a frequent reminder of how to act around animals in a respectful way. Have kids show visiting friends these sets of ground rules and explain why they are important. 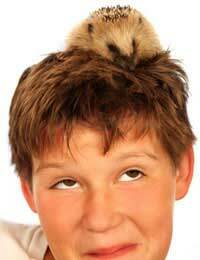 This gives children from households without pets a framework for positive animal play, straight from the kid’s mouth! Teaching your children how to give their friends insight into the minds of the pets in your household is an excellent empathy building technique and may just change the way other children perceive pets in the most positive of fashions. Many children haven’t had the chance to see things through an animal’s eyes, so this can be an excellent learning experience. It’s best if an adult always supervises kids and their friends during playtime with pets, though this can sometimes be tough on parents with busy schedules and little free time. The reason for this is that children aren’t as generally as good as adults at reading the subtle signals and body language signs that increasing frustrated pets give off to try and communicate their patience is coming to an end. To children, pets have suddenly just had enough and end up biting or scratching ‘for no reason’, while to the trained eye a pet has been giving clear signals that playtime is at an end. So having an adult around to interpret keeps visiting children safe, pets in good spirits and saves explanations to other parents when the visiting friend gets bitten or scratched! Any time kids can help their friends learn something new about the animal world and show them how to play with their furry friends in a gentle and caring manner, everyone benefits.